Living human and animal skin is palpably different from a touch screen video display. Digital technologies lie at the far end of a spectrum that begins with completely unadorned, raw, nature as you find it (e.g. unadorned human skin, or a leaf), and stretches to the maximally manufactured, contrived, and artificial (e.g. a touch screen, or a microchip). What could be more synthetic and unnatural than screens, sensors, binary code, and logic circuits? Yet the way people talk about digital technologies readily conflates the digital with the natural, or at least the organic. As an example, a book by Thorsten Klooster surveys the range of innovative “smart” surfaces for potential use in architecture and design, referring to such concepts as “evolutionary nanotechnologies” and “biological synthetic nanotechnology.” Researchers into such digitally-honed surface technologies mine the organic, biological, living, sentient, and natural for terminology, models, and metaphors. In some cases such artificial components incorporate themselves into the organic, and vice versa. Smart surfaces provide a good example of such natural-digital hybridity. These are the high tech surfaces at various scales common enough as solar panels and smartphone touch sensitive display screens that are beginning to scale up as architectural elements, that define spatial envelopes, adjust environmental conditions, harvest and filter data from the environment, and change the shape, function, quality and mood of a space. As known to every student of biology, much of the “smartness” in biology resides in membranes, cell walls, tissues and skins, i.e. surfaces. Synthetic smart surfaces don’t need to wire up to digital circuitry but can include meticulously engineered pigments, coatings, fabrics, and meshes made of tiny components designed to respond to environmental conditions through local bio-synthetic processes. Klooster describes a project to develop one such smart surface. “An inherently nanostructured macro-surface, the reactions of which are not mechanically actuated, but which functions quasi biologically, is to be generated by growing nanotubes under the control of microengineering-based lithographic coating, printing and etching steps” (73). The biological and the digital hook up at the nanoscale. After all, biological processes are mostly of a size invisible to the human eye, as are microcircuits. The other commonality here between the natural and the digital resides in the use of the word “system” to describe any and all natural and artificial processes. For example, human skin is part of the human integumentary system. Several decades of research into systems theory seeks out common organisational substrates by which we understand biology, geology, human organisation, infrastructures, machines, manufacturing, and design. Klooster’s smart surfaces are after all systems (e.g. media facade systems, hybrid energy generation systems, climate control systems). Digital technologies are currently at the top of a hierarchy in which designers, engineers and architects have maximum scope to manufacture, adjust, simulate and test systems. Digital circuitry and code provides a boundless plastic medium through which technology and artifice assert their putative mastery over the natural. From this point of view a conflation of the biological and the digital is only natural. Systems theory builds on the primacy of information flows. Mechanical, electronic, digital and natural systems are supported by the movement of information, and hence communication. This common substrate of information processing further thickens the ambiguity between the natural and the digital. Information flows are obvious in the case of synthetic smart surfaces. Klooster describes surfaces by which people and machines communicate, i.e. interface technologies such as touch screens. There are also surfaces that serve as ambient displays that provide “constant, situation-related, visible and accessible information” (141). His taxonomy builds up to sensor arrays and networks of sensors passing information to actuators that modify surfaces and environments, and their nano-scale variants that might eventually manufacture, adapt and improve themselves as self-organising systems, much as human and animal skin repairs itself. Natural systems convey information (think of nerves), but also energy, materials, actions, and some of this functionality is captured in the design of synthetic smart materials. For my purposes here it’s enough to note that the primacy of information flows in our thinking about systems draws the natural ever closer to the artificial, or at least “ambiguates” the interface between them. Klooster, Thirsten. 2009. Smart Surfaces and Their Application in Architecture and Design. Basel, Switzerland: Birkhäuser. In answer to the question implied in my first paragraph, perhaps the natural artificial distinction is a false dichotomy. So it’s of little consequence that the ideas (natural versus digital) get mixed and muddled, i.e. conflated. I don’t think this is a satisfactory answer to the question of how the natural gets appropriated by the digital. That people think of the natural and the artificial as categories in the first place means that, rightly or wrongly, society attaches significance to the terms, i.e. finds them useful in some way. Expressions such as “back to nature,” “natural attitude,” “it’s only natural,” “natural language,” and “the world of nature,” have use value, as do terms like “digital age,” “digital media,” and “going digital.” It’s a basic tenet of Structuralism to take seriously oppositions such as adult-child, oppressors-oppressed, conscious-unconscious, subjective-objective, and natural-digital, and to analyse, unpack and even subvert them. These oppositions at least signal power relationships that can’t be glossed over, trivialised or ignored. 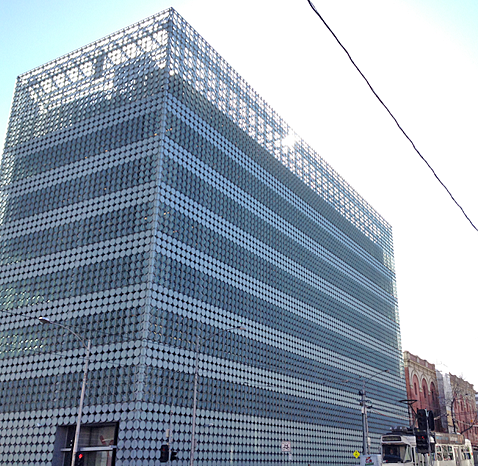 First image is of the RMIT Design Hub, Melbourne, by Sean Godsell Architects. It’s covered in disks designed to move with the sun but as yet there are no solar panels installed. The second image is of an urban screen in Edinburgh.